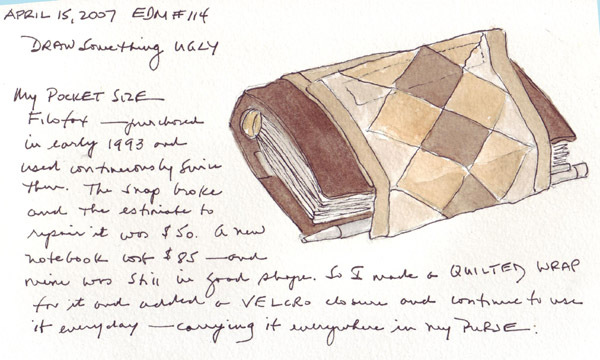 I had a great deal of difficulty selecting something from my everyday life that was ugly, kept for sentimental reasons, and worthy of a sketch. Our almost 35 year old salad spinner, purchased by our first Nannie for our small kitchen in LaJolla, is now cracked, but still working. It is really ugly, especially with a crack in the lid. It is also probably vintage and nearly a first edition! 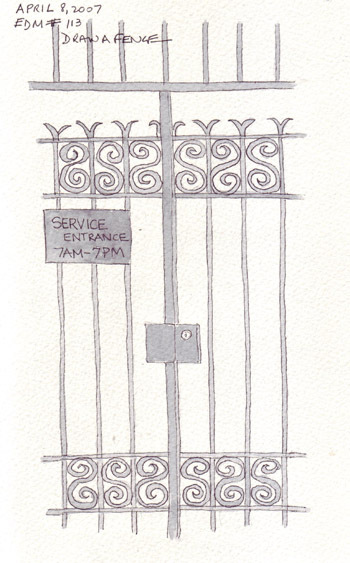 But I just didn't feel like sketching and painting it. So I selected my very favorite, brown leather, pocket-sized Filofax - which was purchased new when we moved to New York City in 1993. The snap on the small piece which closes the notebook is broken, and the estimate to replace it was $50 approximately 5 years ago. A new comparable Filofax was only $85 and I just wasn't ready to retire mine. So I made a small quilted wrap for the notebook and added a long piece of velcro along the end to close it. It is still my only calendar and general all-purpose notebook and it travels everywhere with me in my purse. One of the joys of my visits to the Royal Academy of Arts in London is seeing the prints of Donald Hamilton Fraser's ballet dancers in the Museum Shop. 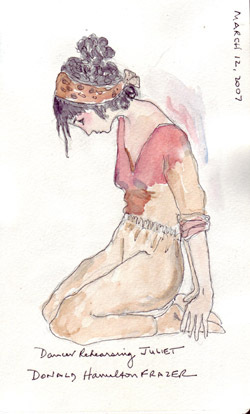 I purchased a "postcard book" with 18 of his postcard size prints of dancers during one of my visits and I tried to capture his sketches in ink with watercolor washes as part of my figure drawing exercises. 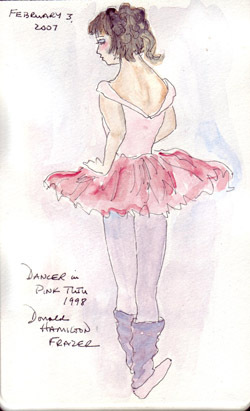 I love ballet, I love dancers, I love sketches and painting of dancers, and especially his prints which I knew nothing about before visiting the Royal Academy this year. 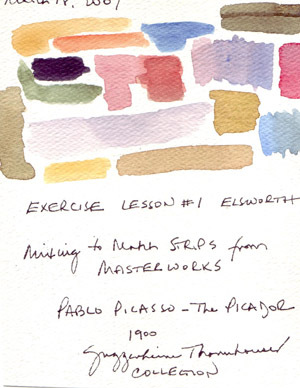 One of the watercolor projects from Chapter 1 in Anne Elsworth's book (Watercolor Skills Workbook - 10 easy lessons) is mixing watercolors to match master paintings. 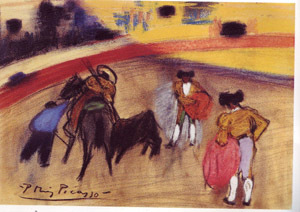 I chose this Picasso piece (which was done in pastels) and used my regular palette of primary watercolors to mix each of the colors that I could see in the print. This is a fabulous way to train your eye and I hope to do more of these projects as I work through her book. I am now done with the projects that I want to do from Chapters 1 and 2 - and ready to move on. I need to plan my way through these exercises and projects slowly if I want to enjoy them. I think I was previously unable to appreciate the 10 lessons because I was trying to rush through the book. 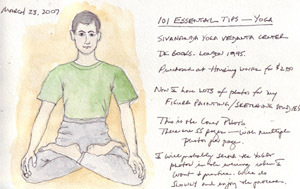 I would never have thought of photos of yoga classes/instruction books for my figure drawing practice during 2007. 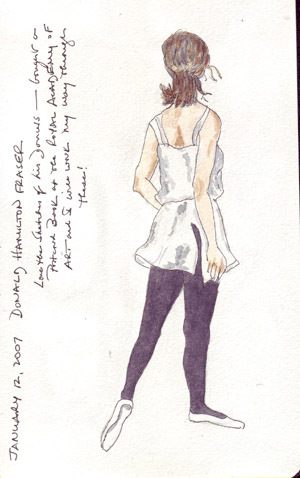 But Christeen http://christeensblog.blogspot.com/ on the EDM group has some great yoga sketches that she did and I found a perfect second hand book to use for photo images. I won't stop sketching ballet dancers, although I don't upload many of them because I'm copying sketches by Donald Hamilton Fraser that I bought at the Royal Academy of Art. I love his style and wanted to try to learn from him through studying his dancers - all of whom are caught during moments between practice or performance sessions. 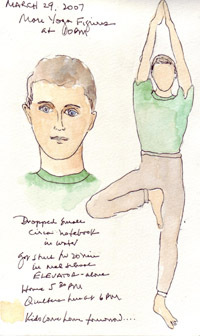 Here are a few of the first sketches of yoga poses.